I feel very lucky to have recently been kindly sent the April subscription box from the French fabric and haberdashery store Craftine. Sewing subscription boxes are becoming increasingly popular, and I could not wait to receive the box and see what goodies were inside! So the boxes are sent over from France and they are issued every 2 months. I rather like this as it gives you enough time to plan and make your garment without rushing before the next box comes through! You never know exactly what your box contains but it will always have fabric, trims, a pattern and surprise items. You will also receive a colour booklet telling you everything you need to know about this month’s gift including information about your fabrics and how to care for them. My box (which by the way is very cute, sturdy and will definitely be kept to store pretty sewing things inside) contained 2 pieces of fabric, a spool of matching thread, a belt buckle, paper pattern and some sweeties. The fabrics were a length of beige gabardine measuring 55×57 inches and some pastel tartan double weave cotton which measured 23×57 inches. 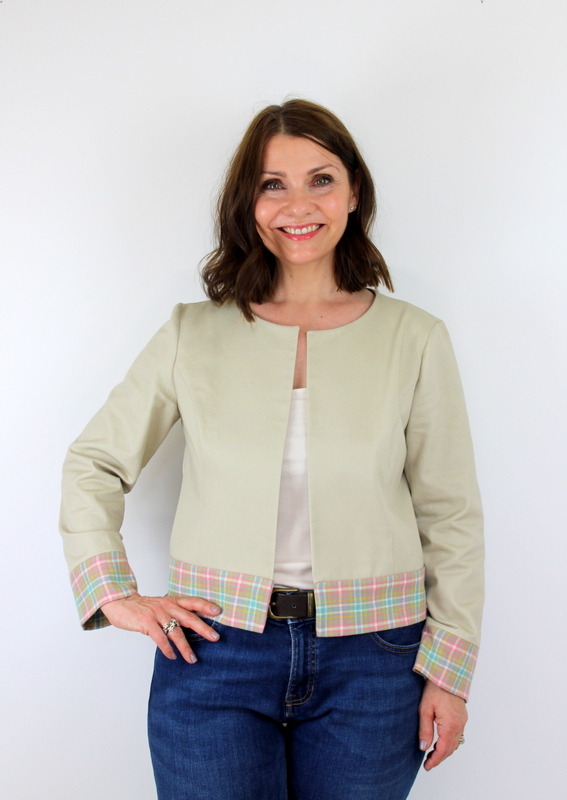 This months box focuses on Spring themed pastel colours and whilst I loved the fabrics and also the fact that they could be used to make a jacket, I didn’t think that I would necessarily suit the cropped trench coat suggested. 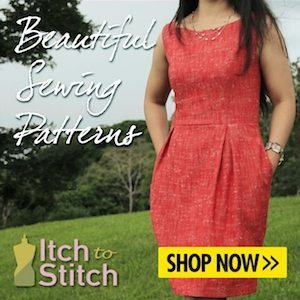 So I had a hunt through my rather too large pattern collection and pulled out a pattern that I have never used before but which was a free pattern with a sewing magazine quite a long time ago – New Look 6302. The fabric quantities were perfect for the little jacket (view D) and I could use the contrasting tartan fabric for the cuffs and waistband. Just right! I am over the moon with how the jacket has turned out. It is a simple cropped jacket with long sleeves and contrasting cuffs and waist band. It has beautiful princess seams and I feel it can be worn with jeans to take you through these sometimes chilly months of Spring. The jacket has an unbelievable 13 pieces, but don’t let that put you off. Great instructions take you through this fairly simple make easily and it actually didn’t take me that long to sew despite the large number of pattern pieces! If you chose to make the simpler cropped jacket without the contrasting bands (view C) it would be even quicker. Also as there are no fastenings I would recommend this pattern for all. The only alteration that I made to the pattern ( I cut a straight size 12), was that I shortened the sleeve pattern piece before I cut it out by 5cm. Sleeves on coats and jackets are always too long for me so I pinned the pattern to my shoulder and roughly worked out how much I needed to lose for it to be the right length for my arm. If I had more time I probably should have made up a toile, as what I did is perhaps not the most accurate way to measure up for your sleeve length, but happily it worked out just fine for me. Phew! The belt buckle provided in the box was not needed for this particular project so will be kept for something special another time. I’m grateful that Craftine have provided a handy tutorial for making it into a belt that I can refer to when that time comes. If you are interested in more information about the Craftine subscription boxes for yourself or as a gift then you can head on over to the UK website for all the details. I believe that they can be purchased individually at £33.90 (free postage), or a years subscription of 6 boxes for £200. The French website allows you to browse through a large selection of their fabrics and haberdashery. Thank you very much to the guys at Craftine for generously sending me this box to review. I have been happy to share with you today my honest thoughts and hope that you have enjoyed this slightly different blog post. I am also thrilled that as a result I have had the opportunity to make up a pattern that has been sitting around in my stash for so long too. At the time of writing, there are several retailers offering New Look patterns at half price – just saying!! Take care, and I’ll be back soon.